A complete guide with updated flow, map, and access info, as well as the story of the fifth known no-portage descent. Click here to watch the video version of this trip report by Chris Korbulic. 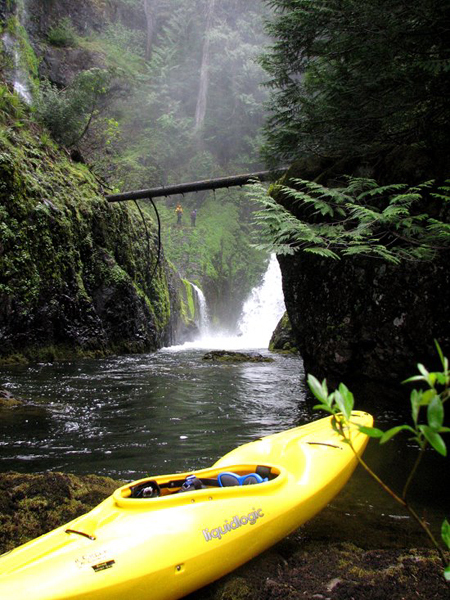 Copyright © 2007, Ryan Scott and Oregon Kayaking. 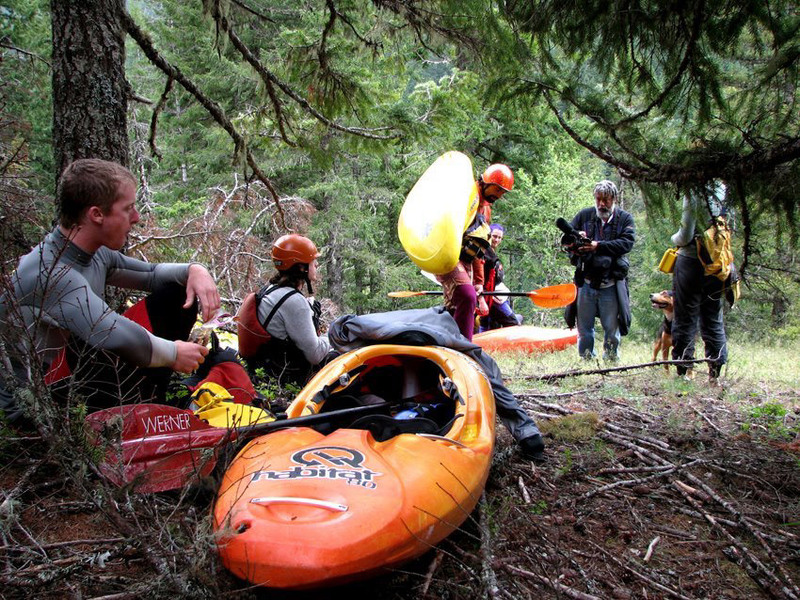 No part of this page may be reproduced, linked, or copied without the express written permission of Ryan Scott and the Oregon Kayaking webmaster. 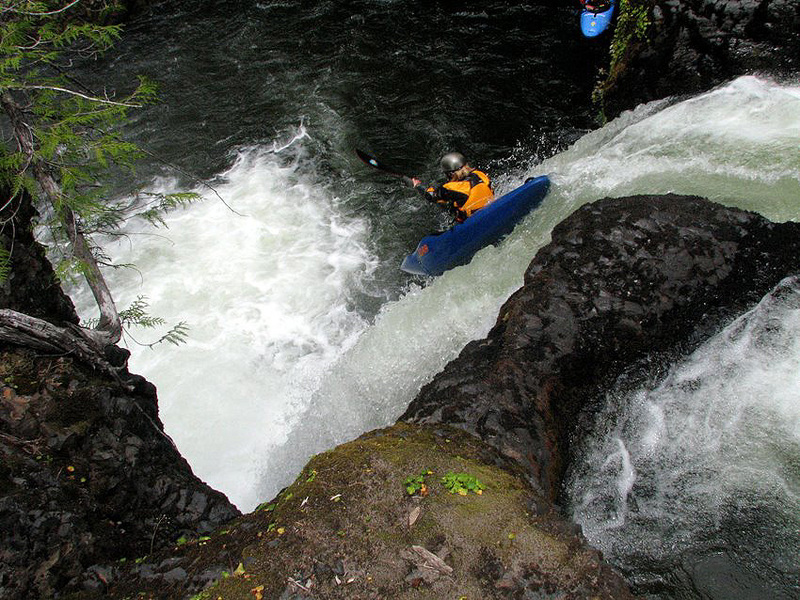 Salmon River Canyon has seen its fair share of talented kayakers pass through the inner gorge since it was first run by Tim Gross and Joel Bandstra in 2001. According to the reports I've heard, this strong team hiked in just above Frustration Falls and paddled the crux of the canyon to the take out three miles below Final Falls. Every drop was run except for Final, which was too big to seriously consider at the time. The Salmon Canyon turned out to be bigger and badder than the initial scouting reports had indicated. Final Falls was believed to be in the forty foot range ( as viewed from the canyon rim, hundreds of feet overhead ) and Frustration Falls seemed like the perfect series of waterfalls. Everything changed once Tim and Joel dropped in and discovered that Frustration Falls required a level of commitment that few kayakers were willing to accept. The last of the three drops in this series stood around forty feet tall, which meant that Final had to be much taller. 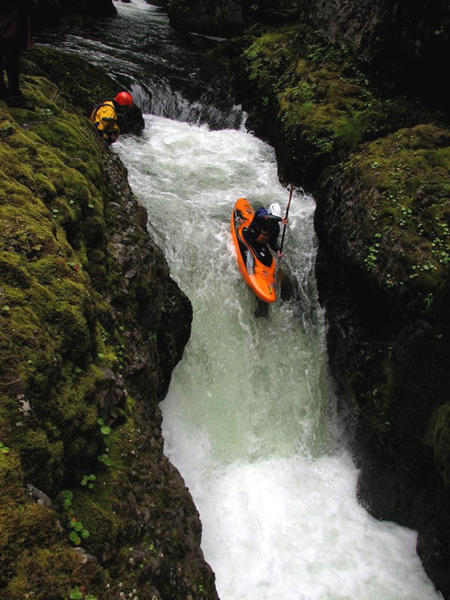 Over the next few years paddlers kept expanding the limits of kayaking, and a few people ran all of the runnable drops in this intimidating, boxed-in gorge. 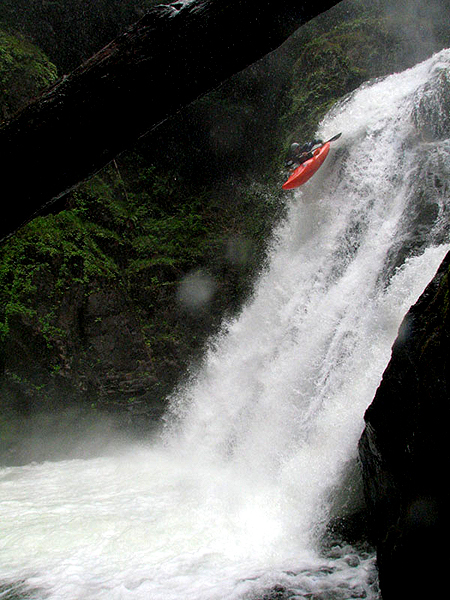 The gigantic waterfall known as Final Falls was first run by Ben Stookesberry in May of 2002 during a record-high water descent. 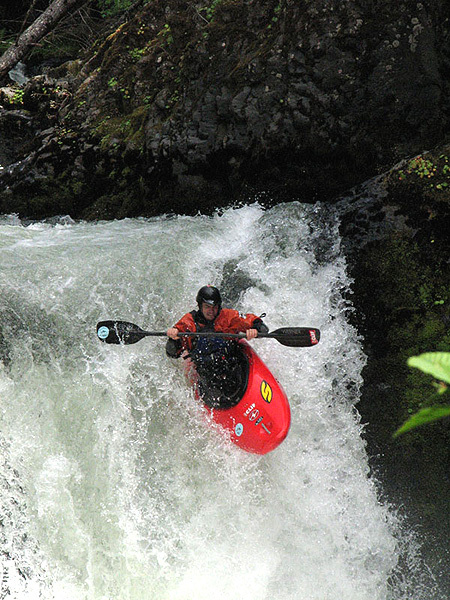 A few other paddlers have followed Stookesberry's lead, but no one has touched it at similarly high levels ( There is an upper limit on flows for this run because Frustration turns from bad to worse at high water, locking you inside the 'Room of Doom' at the base of the forty-footer ). Fast forward to the present. 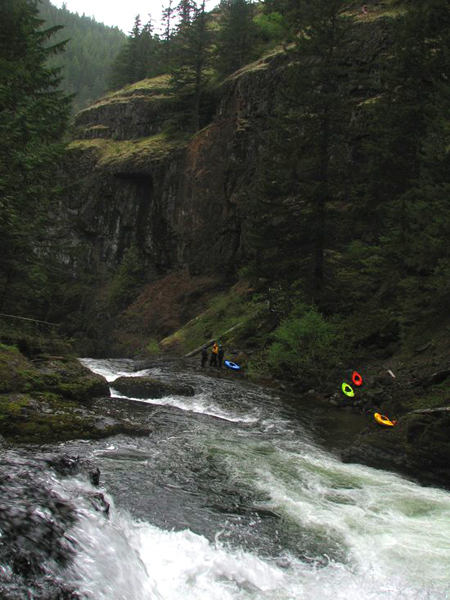 Salmon River Canyon has built a reputation and is on the minds of class five kayakers around the world. Final Falls has now been run four times by some of the best in the business, including LVM's John Grace among others. 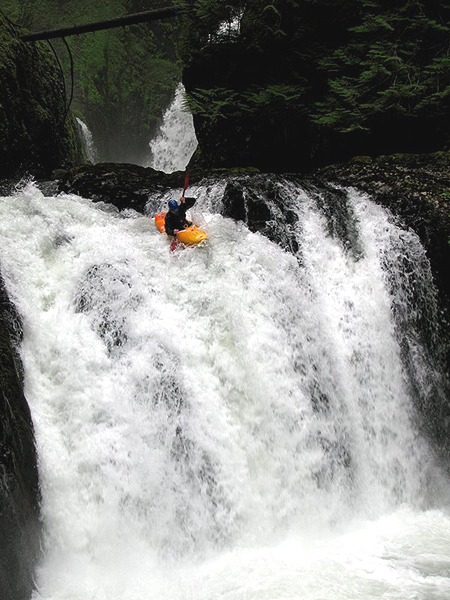 On May 29th, 2007 I was lucky enough to witness Chris Korbulic join the handful of elite kayakers who have run this massive waterfall. On that particular trip we were joined by an Associated Press film crew, who wanted to document our descent. One week later I was scrambling to get back to the canyon before the levels dropped. This would be my seventh attempt overall and my sixth complete descent. As plans were being made I got a call from the PBR crew out of Portland. They wanted to camp at the put in and rally the next day, and since my group had never taken that approach we decided to give it a go. Jason Schroeder, Lana Young, Keel Brightman and I met Luke Spencer on the way to the put in. After a gear transfer and an emergency call to get another spray skirt, we were on our way upstream. That night a few of us hiked our boats to the access point at Split Falls then hiked back to camp in the dark. After a quick dinner I fell asleep, waking at first light to a campsite full of of paddlers. Andy Lichtenheld, Jason Aytes, Brian Eustis, and Mike Northrop had driven in late and were ready to rally. One thing about driving all the way to the put in though, make sure you run shuttle before you do this! We ran shuttle and finally made it back by 11:30 a.m.
Once the shuttle was finished most of the group had already hiked in, so we got everything together and took off down the trail. We finally caught up with the rest the group at the access point for Split Falls. Every minute counts on the Salmon. Teams often run out of light on this run, so you have to be disciplined and efficient. Taking the trail up and over then dropping in at Split Falls saves critical hours needed to complete the run before darkness. After regrouping we descended to Split, groveling through the thick vegetation in brutally hot conditions. Thankfully we were soon within sight of the falls. Hiking in to the canyon with the Associated Press camera crew. Photo taken on the previous week when Chris ran Final Falls. Once Split Falls came into view everyone stood there with their jaws on the ground. Split is a beautiful sight after all the work it takes to get there. I couldn't wait to run this one again so I jumped right in. Drop into the right side, stay right, duck the tree, hit the micro eddy on the right, peel out with a right stroke, hold it, look down, pull though and enjoy the twenty feet of freefall. Such an awesome put in drop! The rest of the crew followed and we were all in the pool below. 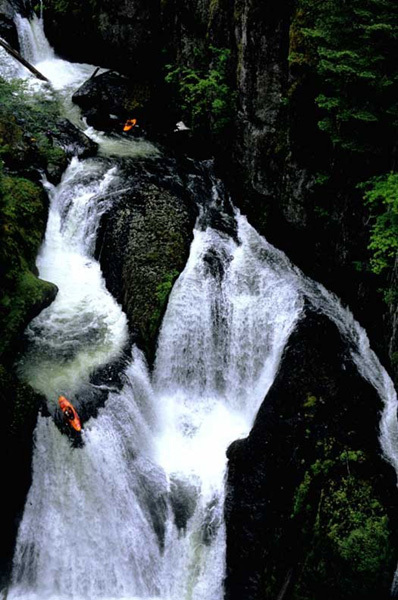 Lana Young drops Split Falls, the put in drop for Salmon River Canyon. This is about as good as it gets! The next rapid is full of wood so a portage is necessary on river right. Luke Spencer seal launches below the log-choked drop. Below the log portage is a mile of mellow class two leading up to Little Niagara Falls. This drop has a lead-in rapid with four slots. They all go, but pick your door wisely. From river left to right I usually take door number two and it is always a gamble on whether or not a boof can be pulled off. If not a short rodeo creeking ride will follow, usually not too bad. Just downstream is Little Niagara, a ten foot ledge drop that has a dangerous exposed ledge at the base of the drop in the center to right of the drop. The left side is deep, but make sure you get over there or you will land on rock! Mike Northrop runs Little Niagara. This is pretty much where you have to be because the entire right side pours onto a rock shelf. Just a few feet downstream of Little Niagara is Vanishing Gorge. The gorge starts with the ominous Vanishing Falls, which is usually run down the right slot channel. Basically you pinball through and hope you hit the outflow below the falls. Vanishing isn't the biggest waterfall around, but it is mentally tough because the landing drops you into a violent, claustrophobic room with undercut walls and strong cross currents. The right side 'hope I make it' line has never looked appealing to me, so I always go straight for the portage on river right. The week before Keel and Chris ran a new line over the center of the falls, landing at the base between the two veils of water. That line made Vanishing Falls look fun but everyone else still walked it. Back to this day, Keel and Andy ran it and had no problems. 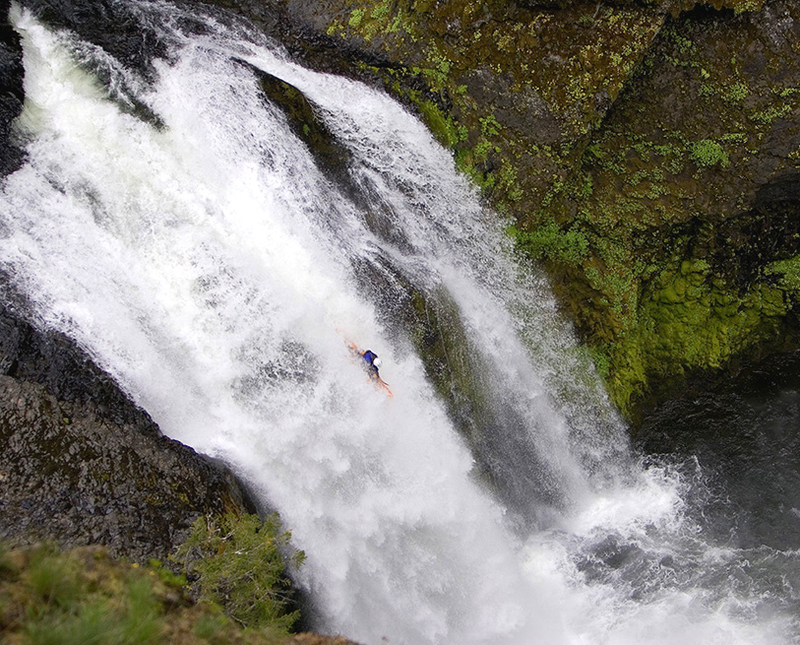 Keel Brightman runs the intimidating drop known as Vanishing Falls. This drop is mentally tough because it drops into a violent, claustrophobic room with undercut walls and strong cross currents. To portage Vanishing Falls a throw-and-go is required. The sketch factor is high here because if you miss one of the eddies on either side of the river and you might swim through the terrifying boxed-in ledge just downstream of Vanishing! We all made it through the throw-and-go and after a brief scout of the exit ledge, we made it to the bottom of Vanishing gorge. 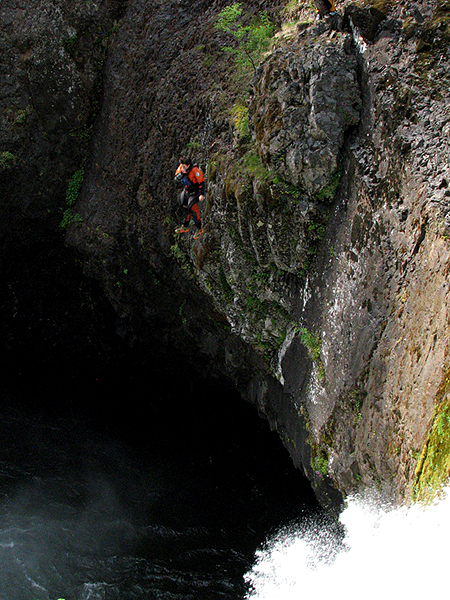 Chris Korbulic runs the boxed-in ledge at the bottom of Vanishing Gorge. Around the next bend is one more fun ledge before you turn the corner to see to one of the most breathtaking sights in the kayaking world. The walls soar overhead and draw you into a seemingly inescapable, bottomless gorge that contains five waterfalls in a row, dropping a total of a hundred and seventy feet. First up is the three-tiered drop known as Frustration falls, which drops a total of seventy feet. To scout Frustration you need to run a small slot up top to make it to river right. On this trip, and the previous week, we had a new piece of wood in the line so a new line was discovered that requires committing to the left side and doing a 'scarier ferry' across to river right through a side channel directly above the first tier of Frustration. 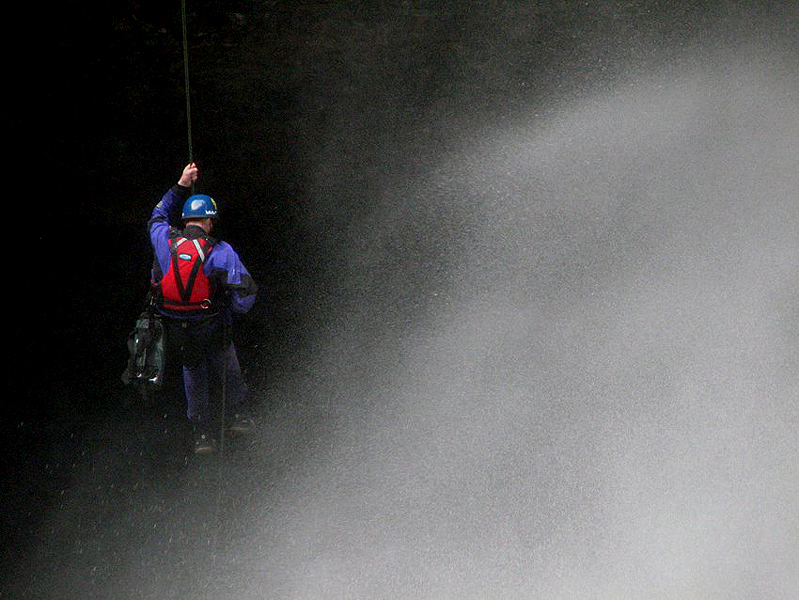 On the right side a creative scramble up and over or a swim through the cave is required to scout all of the falls. We took our time looking at all the options here. Keel was fired up so he took off back to his boat and Brian and Luke followed. They worked their way through each drop one at a time and collected in the eddy at the base of the main bottom drop in 'the room.' After another set of paddlers made it through a few members of the group looked at other options. A seal launch off the bench directly in front of Frustration can be done, but it is sketchy at best. E.J. Etherington tried the throw and go just out side of the final veil in Frustration the week before and hit bottom pretty hard so there are shallow spots in the narrow channel. 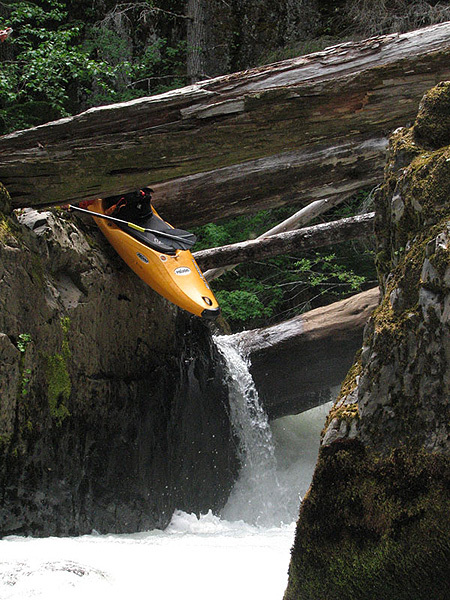 If you decide to portage, be careful! Andy Lichtenheld fires up the final tier of Frustration Falls. He is dropping into 'the Room of Doom', the exit of which is blocked by another part of the falls coming in just downstream. At higher flows there is no way out of the 'room' that Andy is dropping into. Jay battles his way out of the 'Room of Doom' below Frustration Falls. This is why there is such a narrow flow range for this run; if the water is too high you will be trapped in the room by this falls guarding the exit. The pool below Frustration is one of the most secluded spots I've ever been. Massive waterfalls pour in above you as you stand at the top of the next twenty-five foot waterfall and what looks like the end of the world as Final falls spouts off downstream. Looking back upstream at the exit of Frustration Falls. Note the paddlers on the river-right wall. The falls which blocks the exit from the 'Room of Doom' is visible here. I call the twenty-five footer below Frustration 'In Between Falls'. This drop looks so good after what you've just been through. The line is as straightforward as it get in here, but be aware as with all the waterfalls in the canyon it can pack a hefty punch! Jay runs the waterfall just above Final Falls. The exit of Frustration Falls is visible in the background. Looking downstream from the In-Between falls at Final Falls, the monstrous final drop in Salmon Canyon. We all had a great time on In-Between and wandered downstream to get a peek a Final Falls. The view from the lip of Final is amazing. Ever since my trip in 2004 I have written Final Falls off. On that trip I was as fired up as I would ever be to do it, but complications with personal gear pushed me away. Since then I have had no desire to run it, but once again, props to Chris Korbulic for firing this one up! The crew above Final Falls. Luke led the way on the throw-and-go off the right side of Final, but hit bottom just after entering the pool. He tried to warn the rest of us but before he could send a signal Mike went for it and hit bottom also. Both turned out o.k. but it was scary to think about when you are seventy feet up and about to jump that you might hit bottom. 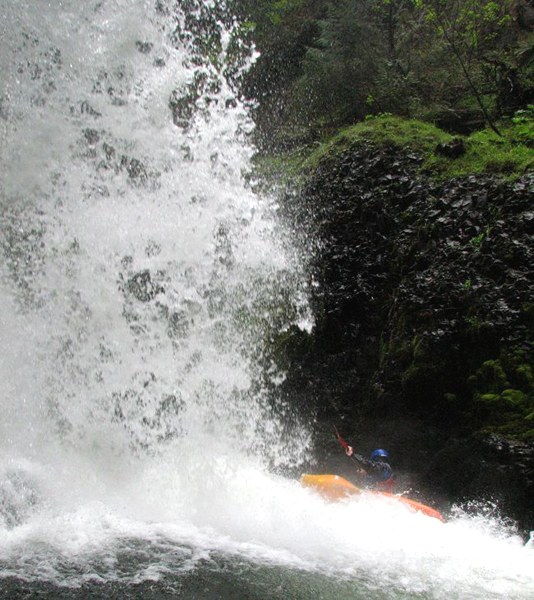 After a few paddlers were at the bottom of the falls Keel gave us the thumbs up. He was standing on the left side of the river and soon sent his boat over the falls. He then climbed back up to the small mossy ledge just above the lip of the Final to take photos. 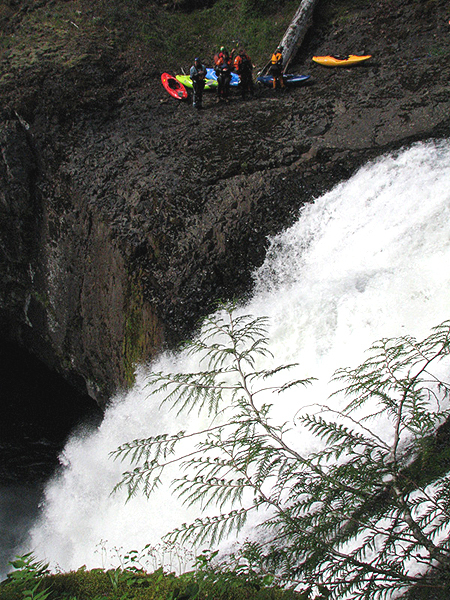 Mike Northrop takes the leap of faith at Final Falls. Keel decided to jump in from the left side of Final Falls. He took one step and then launched off the side, trying to hit the veil of the falls. From my view point above on river right it looked as if he disappeared into the waterfall about halfway down then popped up in the boiling whitewater in the pool. That jump had to be a good ten feet higher than the river right side. I had a climbing rope so the rest of us opted for the rappel on river right using a small tree as an anchor. Note: I don't know how much weight this tree will hold as it is pretty small. It has worked the last three times I've been in there and the right side rappel is better than the river-left options. That said, I'll quote the Yosemite rock climbing guru John Long, who said you should never use a tree as a rappel anchor unless it looks like its been there since the beginning of time..
On the previous week we watched as Chris Korbulic ran Final Falls. As the super-calm and confident Korbulic waited at the top for everyone to get in position below he sent a couple boats off the top of the falls to see how the angle would pitch him. He dropped in and had a near perfect line, but over-rotated just a bit about sixty feet down. He immediately went from plan A to plan B just before impact, tossing his paddle and hugging the deck of his boat. He took a huge hit and popped up in the pool, and with a little help from Chris Gabrielli he was back upright and on top of the world! Chris Korbulic runs Final Falls the week before..
After we finished rappelling off we spent a few moments of enjoying the view then made a mad dash downstream. There is one more portage below Final Falls. We picked our way through some fun/semi-sketchy boulder gardens until we were blocked off by rocks and sieves. We took out on river left and hopped over the sieved-out rock pile. Once back in the water we had easy class three to the take out. This is the Mt. 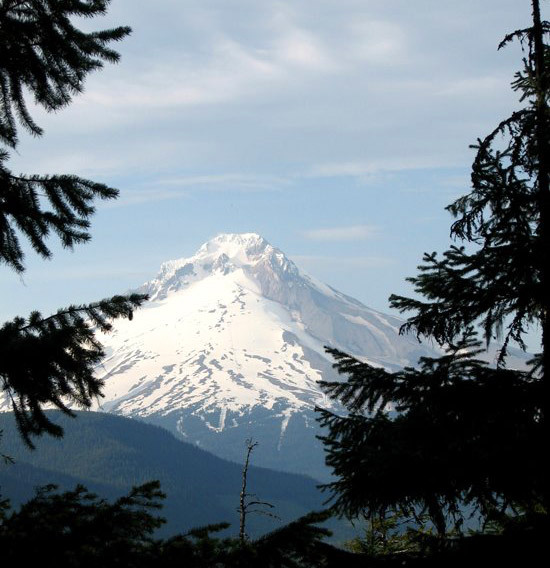 Everest of Oregon Kayaking and should be approached with extreme caution. Once you're in, you're committed. Hiking out is doable, but only in certain areas of the canyon and it is straight up for a long way! Assuming you can climb out, you still have to hike at least three miles out once you are back on the trail. Prepare to suffer if you try to exit on foot. Every trip I've done in there is a FULL day. Generally speaking May and early June is best, depending on the snow pack. I tried it once in October before the snow hit ( to everyone that was on that trip, I'm sorry! ) and we did not have enough water to run the second drop in Frustration and the paddle out was HELL! The flow for this one is tricky because there is no gauge and what you see at the take out channelizes upstream in the gorge, so what appears to be a low flow at the take out may be optimal upstream. The rapid just above the take out bridge should look like just enough water to paddle down it. There is also a gauge rock on the upstream side of the take out bridge, close to river right. It is the biggest rock in the water. If the rapid upstream has waves coming down and you can't find the gauge rock, the exit from Frustration Falls will be blocked off and will look terrifying. A medium flow will leave about two to four inches of the big rock showing. Five to eight inches showing is a low flow. If ten inches are showing I don't recommend running the canyon. 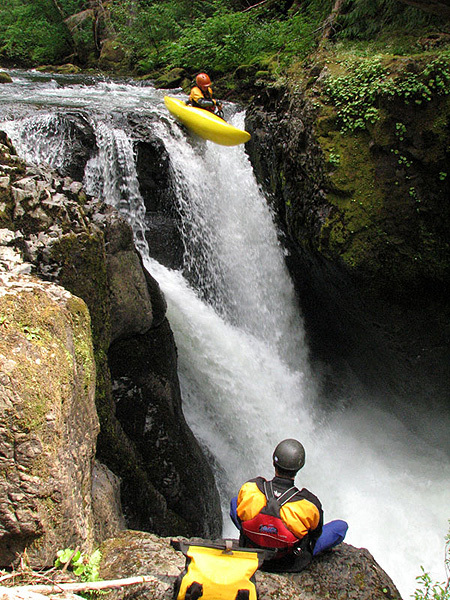 The second drop in Frustration will not be runnable and you might have to get creative with a seal launch just to run the bottom drop, or portage across the falls to river left and just walk down to the twenty-five footer below Frustration. Of course, this only works at very low flows. Take out: drive to the town of Zig Zag, take Salmon River Road beside the Subway, drive eight miles to the bridge that crosses the Salmon River. There is awesome camping here also. Note: The road was washed out on this trip, requiring us to park a mile from the take out so we went as far as we could and paddled the extra mile to our rig. 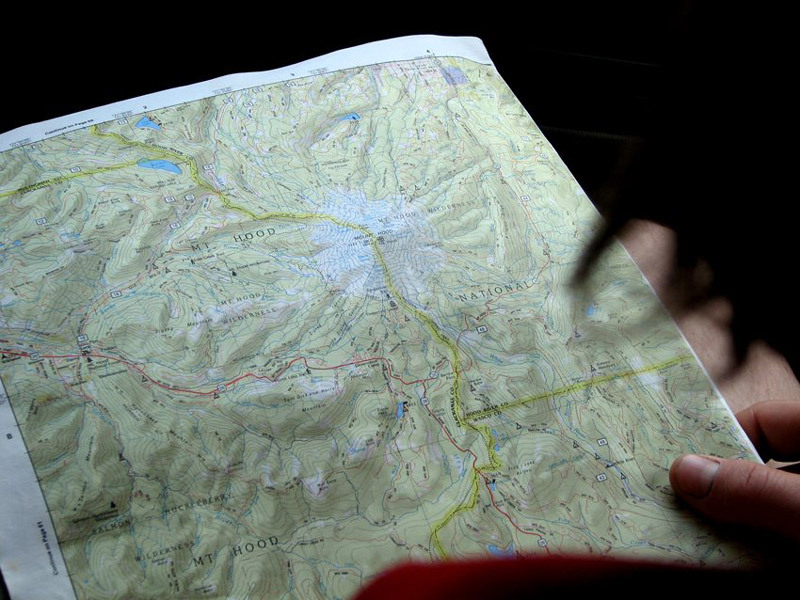 Put In: Either hike up six miles on the Salmon river trail or drive two hours up Highway 26 toward Bend, turn on FR 2660, take 2660 for about nine miles until it T's with 58. Go right on 58 about one mile then right on FR 240. Go about five miles on 240 until you see 240 branch off to the left and change from gravel to dirt, take 240 left and continue to Linney Creek trail head. ( A couple miles after you turn onto 240 left, if it's a nice day, you should see a great view of Hood sitting above the headwater of the Salmon River to the right ). The trail: From Linney Creek trail head proceed down the trail, cross the Salmon river and proceed downstream. About a mile into the hike the trail starts climbing away from the river, cutting back into the tributaries. After about two miles you should hear Stein Falls way down deep in the gorge. Go another half mile down the trail to the first ( small ) grassy meadow to the left of the trail. A trail leads down around the cliff band and down into the old growth forest to Split Falls. 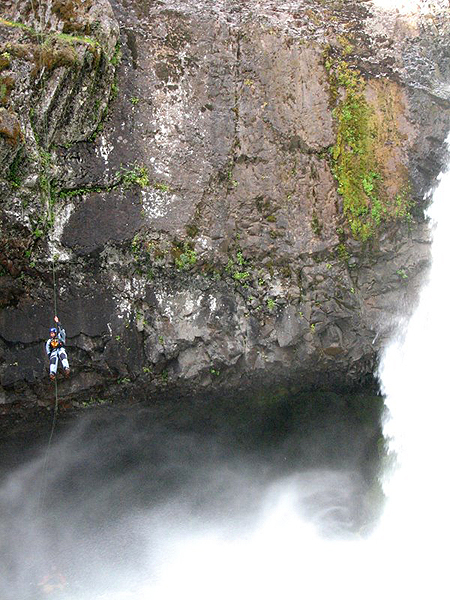 *If you do not have a climbing rope, DO NOT drop in above Stein Falls! The portage around Stein is described in detail in the Fourth Known Descent TR, so read that first if you are thinking about putting in that high. Also, if this is your first time attempting this run it is highly advised that you take a climbing rope. not just for Final Falls, but due to the intense nature and depth of the canyon! A map of Salmon Canyon with all of the falls indicated. 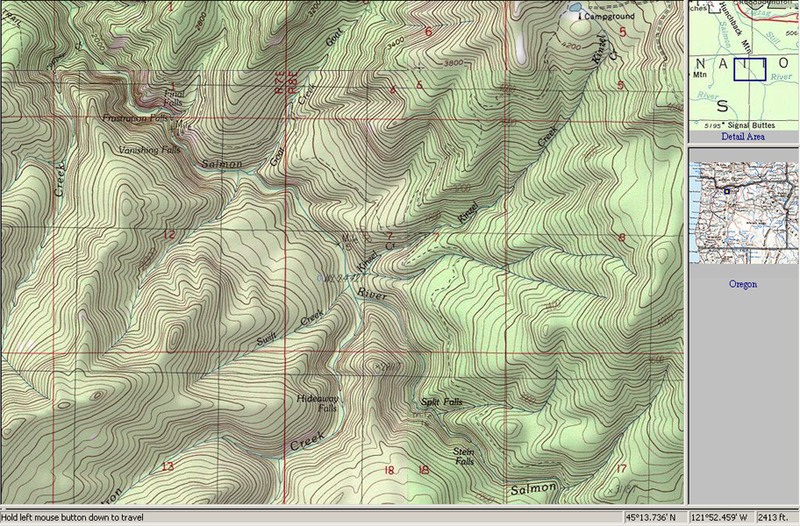 The GPS coordinates at the bottom right mark the location of Split Falls.